This spacious top floor condo has been lovingly furnished to complement the unit's high vaulted ceilings and the big sky views of Mauna Kea. Not all 2 bedrooms at the Fairways are the same! 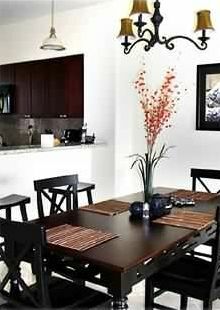 Top floor units have high ceilings and the "Resort" floor plan offers an additional 200 sq ft over the "Golf Villas". We love the expansive feel of this space! FURNISHED WITH AN EYE TO DETAIL: READ OUR GUESTS COMMENTS! Our kitchen is stocked to cook real meals, not just warm-up leftovers. We love the special foods available at nearby Island Gourmet Market! Fresh fish, Island-raised beef and asian specialty foods are just a stroll away. The master bedroom has an isotonic mattress on a California King bed. The second bedroom is furnished with two twins. Pull out the Queen Aerobed to sleep six. We love the view from the lanai, especially when the sun rises over Mauna Kea across the greens. The King and Queen's shops are just a few minutes away. There you will find Roy’s and Merriman’s Café, as well as a surprisingly well-stocked market that has fresh and prepared foods. The beach is a 10-minute walk through the fishponds at The Marriott. Total space is 1420 square feet. This is our little bit of paradise, our home away from home. About the Condo Complex: This classically-styled Hawaiian resort complex is surrounded by the lush fairways of the world class Beach Course of Waikoloa. It is across the lake from the Kings' Shops and the white sand beach of Anaeho'omalu Bay. The infinity edge pool with elevated rock spa overlooks the ninth hole and Kings' Lake. WALK TO THE BEACH! A-Bay has incredible sunsets and is a great swimming beach. You can also kayak, snorkel and even take wind surfing lessons here! Within a 15 minute drive are many other amazing beaches. There are books in our unit that describe these beaches and how to get to them. GREAT GOLFING! Two 18-hole golf courses, the Waikoloa Beach Golf Course and the Waikoloa Kings Golf Course are onsite. The Mauna Kea, Mauna Lani and Hapuna Prince Golf Courses are all within a 20-minute drive. There are cleaning supplies in the condo. Daily maid service is not included, but you can call our property manager to arrange a cleaning. I grew up in San Francisco and still live in the Bay Area. I first visited the Big Island 20 years ago and now consider it a second home. I've been a frequent visitor to Hawaii for the 20 years and finally bought on the Big Island because it has such a variety of activities within a day's drive. We chose this area because it has the most amazing white sand beaches on the Islands! There are swimming beaches, snorkeling beaches, boogie boarding beaches, windsurfing and luxury beaches - all within this 30 mile stretch of the west coast. I personally also love the black lava landscape, full of skies so big you can see the weather miles away. I tried to furnish our unit to match the simplicity and feel of the landscape. We chose this particular complex because it is within walking distance of all you might need beside incredible water - such as groceries, cafes, restaurants and shopping. I love a vacation where you don't have to get into a car. Guests are welcome to use fins, boogey boards, coolers, beach chairs, beach towels and snorkel sets. Everything was absolutely amazing. From the booking to the day I left...any question I had was answered quickly and thoroughly. The company that handles the rental was always willing to b helpful. I only called them 2x and they had answers for both questions and did everything the way they said they would. Now the unit was very well stocked w incidentals. It was clean. The complex itself is very quiet and relaxing. If u r looking for a party scene this is not for u...there is quiet time and they mean it. But that is why we stayed there. I would recommend this unit to anyone looking to relax and enjoy themselves. It has plenty of beach chairs and stuff to enjoy the beach a short walk away. And the sunrises on the lanai r beyond compare. There is Netflix and roku and a new 50 in. TV in living room. The apartment is very big and very nicely kept (It's even better than the pictures). It's a very nice area with a lovely pool and the parking space right in front of the entrance and with A-Bay just 10 minutes away on foot. We used the apartment as a base for exploring the entire island and had a really good time. Can only recommend this place. The owner responds quickly to enquiries (had some questions about our booking before our trip). Would recommend the everyone and would stay here again. We just recently stayed at this villa for a family vacation (myself, wife, and 2 kids - 8 and 5 years old). This villa is perfectly located on the island, close to amenities, beaches, golf, and has everything you need. It includes all the beach toys, chairs, and snorkeling equipment that you could ever need. The lanai faces east towards Mauna Key, is right across from the pool/fitness area, and in a small gated area surrounding the golf course. You are within 20 minutes of so many great beaches (Hapuna, Mauna Key, Kua Bay, A-Bay, Beach 69, 49 Black Sands, etc) and within 25 minutes of downtown Kona. We found ourselves making breakfast most mornings, but walking over to the King's or Queen's MarketPlace for fresh pastries occasionally. We successfully went to 9 beaches, the Hilo side of the island for a day, Akaka Falls, Rainbow Falls, Zipline adventures at the Botanical Gardens, a Luau and went golfing 1 morning. The owner and the management group are great to work with and very quick in responding to your questions. We've stayed in multiple rental VRBO properties in the past and would easily say this is one of the best experiences we have ever had. The pictures don't do this place justice for how well kept the villa is. We would definitely return to this rental in the future. Even better the 2nd time. Teresa B.Where do you live? We spent 5 wonderful weeks at Fairways Villas #32915, This was our 2nd stay and we loved it, The unit is fully equipped with all we could want or need, Comfy bed, quiet, clean,overlooking the golf course toward Mauna Kea, Great parking spot right near the front entrance which was handy for luggage, beach gear and shopping, There are communal BBQ's for the complex which is a great way to meet other folks.We enjoyed our morning walks up to the Hilton and around the area, Tons of birds and wildlife, lovely flowers and plants and trees. Easy walk to the Kings and Queens shops. Easy drive to Mauna Kea and Hapuna beach which are our faves. Check in, Check out was really easy and the damage deposit was returned promptly, Thank you Andrea. We look forward to next time. It was a great area, everything in walking distance. However, there are no sidewalks around the condos, except only from your parking stall to your building. So, walking at night, in the dark, with little kids was terrifying. You're literally walking in the street for a while within the condos until you get to the front gate. I'd suggest bringing a red flashlight when out and about at night. I had to email twice, to get an answer from this condo owner. I sent another question via email- and was never answered. I just assumed you have to send emails TWICE every time if you'd like to get some answers. However, I didn't care to follow up on my second question, so I never sent the 2nd request. This place was very nice for a family- only missing a high chair! Plastic wares, wipe-able tabletops, pack n play, carseat & stroller, sand toys, and sand gears all available. It is on the 3rd floor, so you'll have to take the elevator, or use the stairs. The pool & work out facility is literally the next building over- so near by! They do have a 'pool attendent' at times who'll be at the pool gate, keeping track of how many people enter and leave, and from which units. Great for the fact that you wouldn't have to worry about extra unwanted guests at the pool, who like to pool hop. A-Bay is also literally a walk away- walk through Kings shop, hop across the street through Marriott Waikoloa, and through their pool area to the beach. A-Bay was also pretty calm for toddlers to play at the shore line. My older 2 kids, 9-11- preferred a few waves. There was also a long coral a few feet out- that you'll have to watch out for, it scratched up my kids pretty good. But once you're past that- you're good to go. However, water wasn't as clear as other beaches we've visited. The unit was easy to find, clean and well stocked with kitchen utensils, snorkeling gear, and bath and swimming towels. There was ample space for all to spread out and it was very handy having WiFi. Parking was right outside. Across the road is the gym and pool and it's literally minutes to shopping and the beach. A beautiful place to stay. The childrens only recommendation is to have instructions on how to use the television!